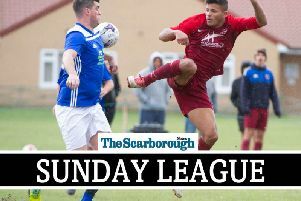 Three players saw red in a frantic finale as Filey Town edged Hunmanby United 5-4 in a thrilling start to the Scarborough Saturday League season. Town had the better of the first half and went 2-0 ahead through an own goal and a Will Hunter header, only for James Pinder to pull a goal back. Lalan Flynn restored the two-goal lead for the hosts before the interval. United stepped up a gear after the break and took the game to Town, and soon pulled a goal back, only for Hunter's free-kick to make it 4-2. Pinder then notched a second to pull if back to 4-3, and Stu Dickens added a fifth for Filey with 20 minutes left. United striker Pinder completed his hat-trick to give United hope of a revival and then tempers started to fray, both sides having a man sent off for a second bookable offence, Tom Micklethwaite for Filey and John Emmerson for United, and the visitors were then reduced to nine men when player-boss Leigh Franks was shown a straight red. The home side were then awarded a penalty-kick, but the spot-kick was saved by the United gloveman. Town keeper James Jenkinson pulled off a stunning save to maintain their lead late on and they also cleared an effort off the line, and missed a good chance to make it 6-4 themselves. Filey player-boss Jordan Philliskirk said: "It was a great derby game with a bit of everything going on, goals, sending-offs, goalline clearances and a penalty miss. "It was a great game to be part of, it could easily have finished 6-4 to us or 5-5 so I am glad we got the win to start the season off with. "Ryan Tranmer and centre-forward Joe Gage were the men of the match for us." Scarborough Athletic midfielder Jimmy Beadle banged in a hat-trick to fire Edgehill to a 3-2 win at his old team, defending champs West Pier. Pier started brightly and had the better of the opening 25 minutes, but Beadle struck twice before the interval to put Edgehill in the driving seat. Niall Gibb pulled a goal back for Pier after the break, but fine work from Jackson Jowett, another Boro player, set up the visitors. man of the match Beadle for a fine finish to complete his hat-trick and seal the win for Steven Clegg's side. Sean Exley fired in a second goal for Pier to give them late hope of snatching a point but Edgehill hung on for a winning start to the season. Edgehill chief Clegg said: "The two young lads who started for us, 18-year-old Josh Wallace and Robbie Scarborough, 17, played well for us as did our new signing Ricky Nock. "I was disappointed to let in two weak goals but I'm very happy with the result." Pier boss Andy Spivey said: "Niall Gibb, Simon Reeves, Mikey Pickering and Simon Reeves all played well for us. Jimmy Beadle was clearly the difference, as we know from his time with Pier he is exceptional at this level." Edgehill Reserves got off to a winning start, but had to come back from 2-0 down after 20 minutes to triumph 6-2 in their Division Two game at Eastfield Town. Brad Craggs opened the scoring for Town, formerly known as Falsgrave Athletic, after only five minutes, then Jamie Cornish added a second, but after the opening 20 minutes Edgehill started to take control and won with ease. Edgehill man of the match Benny Davis netted a hat-trick while Ryan Link notched a brace and Callum Myers also scored. Ryan Link and Alistair Jennings also impressed for Ricky Greening's reserve team. Cayton Athletic dug deep for a 2-1 home win against league newcomers Eastfield Athletic. The hosts, who were formerly Commercial, started the first half strongly and made loads of chances but the Eastfield keeper kept them in the game. Cayton scored 20 minutes into the second half through a Ryan Somers penalty after he had been fouled in the area. Then Michael Hernandez slotted it in from just inside the box from a Lee Plant pass to make it 2-0. For the last 10 minutes the visitors played direct and got a goal from a long ball. Town then got a second penalty after a handball, but Freddie Schmuck's penalty was kept out by a great save from the Eastfield keeper but the home side held on for the win. Goldsborough United won 5-3 in their derby game at Fishburn Park. Carl Harris opened the scoring for United but Park levelled after an errant back-pass from the visitors. Andrew Hardy headed United back into the lead but another poor back-pass allowed Fishburn to make it 2-2. Ryan Roe restored United's lead again with a free-kick just before half-time. Ben Watson doubled the away side's lead with a lovely chip over the Park keeper and Peter Diaz-Thomson sealed the win with a fifth before Park hit a late consolation.